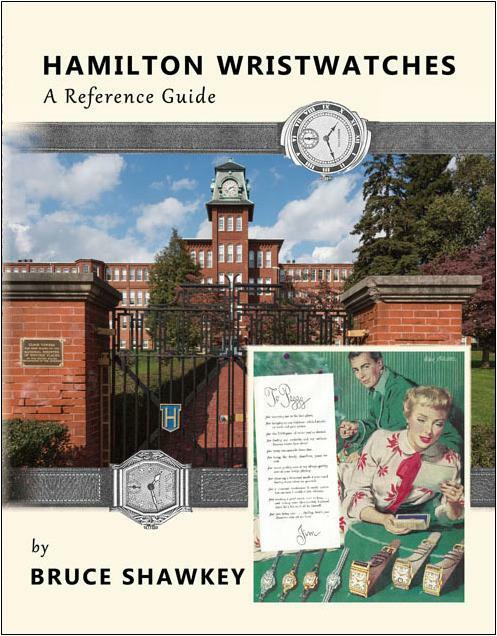 I am pleased to announce that Hamilton Wristwatches: A Reference Guide, the first Hamilton wristwatch identification book to be released in 17 years, is now available for order. 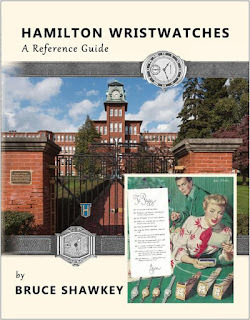 "Bruce has done the watch collecting community a huge favor with this book," says René Rondeau, Hamilton watch historian, and author of the last ID book on Hamilton mechanical wristwatches. "My own Collector's Guide, published back in 1999, has been out of print for many years, leaving a serious gap in the modern watch collector's arsenal of essential information." 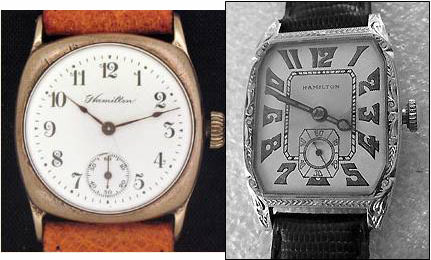 So great is the demand for an identification guide on Hamilton wristwatches, that copies of Rondeau's out-of-print book have sold for as much as $500 on eBay. The new book retails at $49.95. I approached Rondeau in 2014 about his interest in writing a second edition to his book. As great as his passion still is for Hamilton watches, he said he just didn't have the time or energy to do it, and so passed the torch to me to write the followup book. The 226-page book (compared with Rondeau's 182) contains about 20 previously unknown models or model versions that have come to light through the efforts of dedicated Hamilton collectors who have shared their discoveries through articles and online discussion forums. These include The 1917 0-size "Cushion," the 18kt gold "Rectangular," the "Vancott," and the "Model A" to name a few. 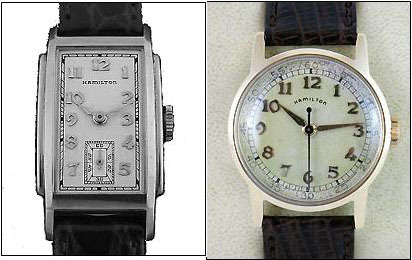 Also, 19 "Hamilton-Illinois" models made in the mid 1950s are identified, in addition to the so-called "M-Series" watches made in the early 1960s. Perhaps most importantly, quality of the nearly 900 watch images has been greatly improved from Rondeau's 1999 book thanks to advancements in digital imaging during the past 17 years. The 0-size "Cushion" (left) and 18kt gold "Rectangular"
Two years in the making, the book involved the help and cooperation of Rondeau, and two additional recognized experts in the field: Mark Cardelucci, webmaster of the web forum, vintagewatchforums.com; and Dan Keefe, blogmaster at hamiltonchronicles.com. "Bruce's book will serve as an invaluable resource to future generations of Hamilton collectors," says Keefe. "I commend him for his tenacity and his dedication to pulling it together." In all, 892 images from company catalogs and collections were scanned and digitally enhanced to make identifying any known Hamilton model easier for collectors. The watches are arranged chronologically, and Watch Identification Tables located at the end of the book enable the user, in about three or four steps, to narrow the identity of a given watch to a handful of choices. Those choices can then be looked up by picture, and a positive ID made. In addition, each watch lists the case composition, movement or movements used in the watch during its production, and the number of years the model was produced. Production numbers (i.e., units that left the factory) are also provided for models made between 1917 and 1940. I must tell you up front that Hamilton Wristwatches is NOT going to be the perfect book for everyone. I have not covered certain "on-off" (one-of-kind) special order watches and special order dials. (However, factory dial variations -- such as white or black -- are noted.) Also, band attachments (straps and bracelets) are not covered in the book, which I know is of interest to many Hamilton collectors who want specimens with original attachments. Such an undertaking was, I felt, impossible to accomplish and would bog down the book for mainstream collectors. Think of this book as "Rondeau Version 2.0." Another better, more detailed book will ultimately come along, but I won't be the person to write it! Also, as with Rondeau's 1999 book, the time period covered ends at 1969, when the production line at Hamilton's Lancaster, Pa. factory was shut down. This is generally considered the "end of the line" for most Hamilton collectors. There is interest cropping up in post-1969 Hamilton models, but again this will have to be addressed by a future author! I also did not include market valuations. Such an attempt is a fool's errand because ultimately price is determined by what a willing buyer and seller agree upon. Condition is also a huge consideration. Anyway, such market value information is readily available online from such sources as eBay for free, or from terapeak.com, or watch-prices.com, both of which are by paid subscriptions. If you would like to buy a copy, click on this link. Cost is $49.95 plus postage. This is the single source for the book. It is not available in bookstores, nor on amazon.com or any other online source at this time. Thanks to all of you who provided support and encouragement on this project!